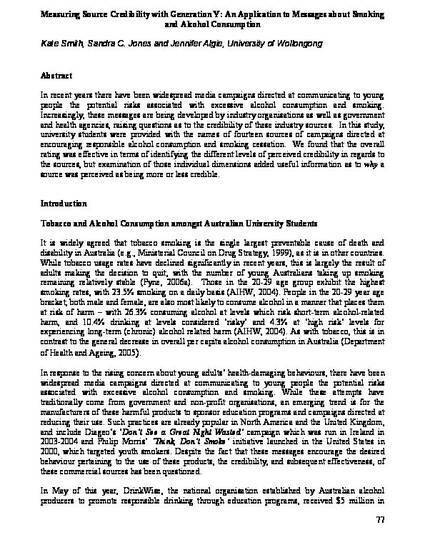 This conference paper was originally published as Smith, K, Jones, SC and Algie, J, Measuring Source Credibility with Generation Y: An Application to Messages about Smoking and Alcohol Consumption, Proceedings of the Social entrepreneurship, social change and sustainability: International Nonprofit and Social Marketing Conference, Brisbane, 27-28 September 2007. In recent years there have been widespread media campaigns directed at communicating to young people the potential risks associated with excessive alcohol consumption and smoking. Increasingly, these messages are being developed by industry organisations as well as government and health agencies, raising questions as to the credibility of these industry sources. In this study, university students were provided with the names of fourteen sources of campaigns directed at encouraging responsible alcohol consumption and smoking cessation. We found that the overall rating was effective in terms of identifying the different levels of perceived credibility in regards to the sources, but examination of those individual dimensions added useful information as to why a source was perceived as being more or less credible.